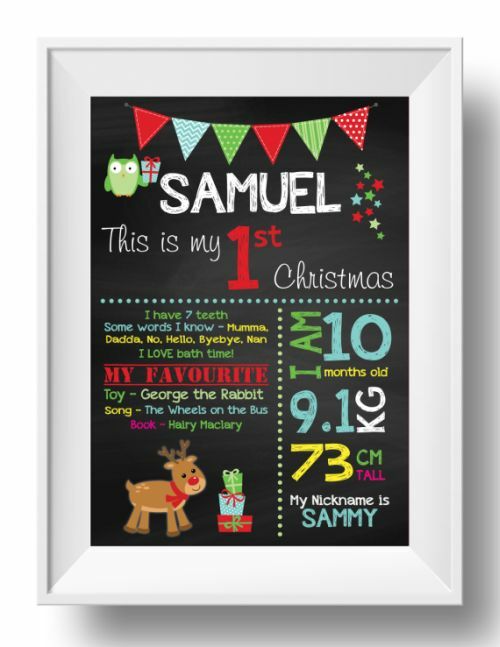 Are you looking for a custom chalkboard wall art print to celebrate your boy's first Christmas? This may be just what you had in mind! You can choose between 400mm x 500mm, A3, A4 and 8" x 10". The art is available as a digital file as standard which you print yourself. If you would like this printed in card or on canvas, please contact me for a quote. After printing, pop your new piece of art into a frame and you've got a wonderful keepsake. Please note: Price is for digital file only - no physical product will be shipped. If you'd like the text or background in colours other than what is offered, please advise your preferred colour in the text box below. I can easily print in alternate colours for a small additional fee, but please keep in mind, this process will typically take several days. I can print in alternate sizes. If you'd like a quote for a different size piece of art or to have artwork printed on card or canvas, please contact me. ** Please select "Digital File Only" at checkout to ensure you aren't charged shipping!